...the kind of movie in which an uptown lesbian couple, played by Sharon Stone and Sofia Vergara, pay a guy who looks like John Turturro to have a three-way. I believe we call that kind of movie "fantasy" - although it's certainly not my fantasy. And appropriately, Woody Allen plays Turturro's "pimp." I prefer my fantasy movies to have hot elves in them. Or even hot dwarves as in the second installment of The Hobbit which I finally saw. And an elf-dwarve romance, wow. I don't think that ever happened in the original Tolkien. Also not highlighted in the original books - Legolas is a orc-killing machine. He was in the Rings trilogy and he's even more so in The Hobbit II. Which would make sense because he's even younger at the time of the Hobbit. It's a bit ridiculous though, how much killing he does, at hyper speed. It looks like a video game. 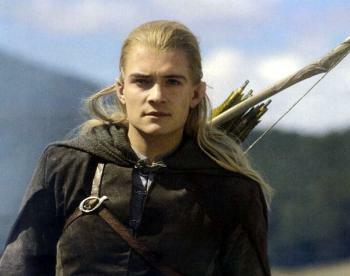 But it sure is nice to see Orlando Bloom in that long blond hair again. He's a major reason to watch the Hobbit II. I also finally saw "American Hustle" too, and I thought it was extremely overrated. The actors are all great, but the plot itself falls apart. And I hated what happened to the Bradley Cooper character. Also, much of the movie was allegedly set in Camden NJ but I saw nothing that looked like Camden in it. At all. And the Philly/South Jersey accents were crap as this NYTimes article explains.